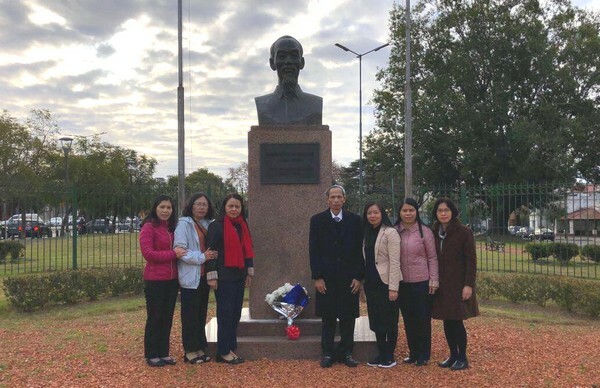 In Argentina, the delegation shared information and experiences on promoting gender equality and discussed the opportunities of cooperation between the VWU and potential Argentinean partners in the areas of female leadership, researches, training, and delegation exchange programs… Specifically, the delegation paid a floral tribute to late President Ho Chi Minh at his statue in Buenos Aires capital; visited and worked with the President of Argentina’s National Institute of Women, the Chamber of Deputies and Argentina – Vietnam Friendship Parliamentarians’ Group, University of El Salvador, and the unit overseeing women’s affairs of Buenos Aires as well as President of the Argentina – Vietnam Cultural Institution. Over working sessions, the delegation gathered more information about current Argentinean women’s situation; laws and policies on women empowerment in several fields, for example: the Argentine National Congress sets the target for women’s participation in parliament of 50%; Argentine government and the non-governmental organizations’ initiatives to support women including income, employment generation, and gender based violence prevention. 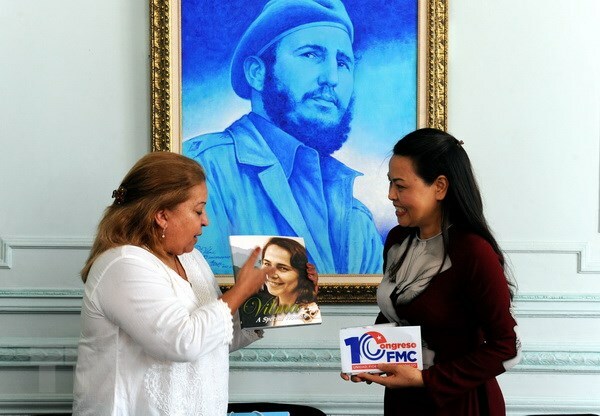 The FMC shared information on the results of their activities, the situation of Cuban women, as well as their experiences in promoting women’s praticipation in politics, scientific research, health, and in discovering, introducing and fostering women leaders. 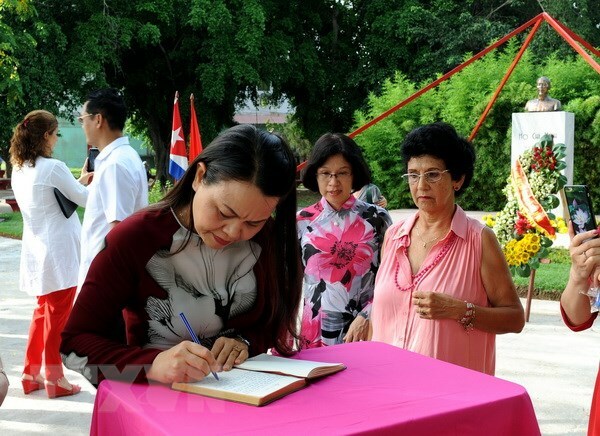 VWU President Nguyen Thi Thu Ha highly appreciated the attention and leadership of the Cuban Party and State, the leading role of the FMC in the women’s movements as well as the significant role of Cuban women in the revolutionary struggle, implementation of the model of economic reform, and contribution to the construction of socialism in Cuba. Mdm. Ha was also impressed on Cuban women’s participation in technology, natural science, public governance, and the National Congress, which has three out of five Vice Presidents of the Cuban State Council being women, and women make up more than 50% of the Cuban National Congress. VWU President Nguyen Thi Thu Ha also shared with the host about the achievements of the VWU, as well as the role of the Union and Vietnamese women in building new-style rural areas, developing national economy, building a strong VWU organization, participating in building the Party and government clean and strong. Within the framework of their visit in Cuba, the delegation had various working sessions and important activities, such as: meeting with Jose Ramon Balaguer, Secretary of the Communist Party of Cuba Central Committee, and head of its Department of External Relations; visiting the regional office of the Women’s International Democratic Federation, and several Cuban social organizations including the Cuban Institute of Friendship with Peoples and the Cuba – Vietnam Friendship Association, the Committee for the Defense of the Revolution, the Central Committee of the Young Communist League of Cuba, Cuban General Confederation of Labor; visited the Molecular Immunology Center, and the LabiofamPharmaceutical Enterprise; visiting the residential complex and the FMC at the grassroots levels, environmental tourism project cooperated between the cooperatives, the National Association of Small Farmers, and the FMC; paying a floral tribute to late President Ho Chi Minh at his statue in Hoa Binh (Peace) Park in Havana, and other activities. The VWU high delegation’s working visit to Cuba and Argentina ended successfully, which payed the way for developing the cooperation between the VWU and various potential Cuban and Argentinean partners in gender equality and women’s development in the upcoming time. 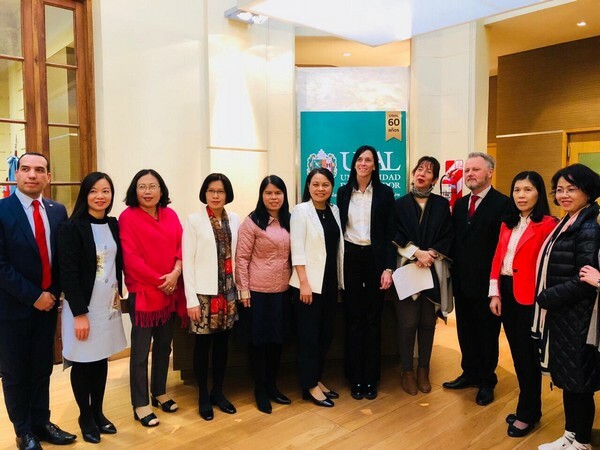 Especially for Cuba, the delegation’s visit has contributed to affirm ing the bilateral friendship between the two Parties, people and women of Vietnam and Cuba, which helps promote the cooperation between women of the two countries in the context of promoting innovation in the construction and protection of the socialism.